If you want your WordPress blog to rank higher in search engines, you need links and social media shares (and lots of ’em). You know about the “normal” ways of getting links, but you’re stuck. Guest posting, article marketing, and all that nonsense (heh) just doesn’t work that well. 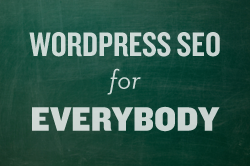 So, today, as part of the WordPress SEO for Everybody series, I’ll show you an awesome way to score natural, organic links to your blog. But how do you get people to talking? Mark presented “The Six Buttons of Buzz,” and when you know how to use them, you can make your content go viral (more links, more social media shares, and more conversation). I’ve used these six buttons of buzz ever since I learned about them. And every time I do it, and execute it well, I get tons of new links AND social media love. I know you’re ready to start pushing buttons, but you’re probably wanting some more information about each individual button, right? Find something your audience thinks they shouldn’t do, and then do it. Or find something you shouldn’t say, and say it. (Disclaimer: don’t do anything stupid, illegal, life-threatening, or any of that jive. If you do, you hold no one but yourself accountable). This is the dangerous button. It almost always works, and Hughes says that. But you must make sure your outrageous actions or comments are connected to your overall results. This is self-explanatory. If you make people laugh, they’ll share your stuff with their friends. For example, when I often talk about font sizes, I say “Size 14 is the new size 12,” and people laugh. And thus, people always quote me for my comment. You can’t engineer this. You need to write great content, but luckily, there’s certain types of articles that are perceived as “great content,” and we’ll go into that in a later article. People like secrets, and they like to share them with their friends, too. Why? Well, first, sharing secrets is a little Taboo, but people like to feel like they are “in the know.” So, calling something a secret, and delivering a secret, will work. Now how does this work out in the wild? You may think your articles hit one of these buttons, but unless you make it overtly clear, you’re doing it wrong. If you write an article and push the “Taboo” button, you must make it clear, and explain why. For example, when I wrote the article “The Content is King Myth Debunked,” I did just that. Everyone parrots “Content is King.” So, when I called it a myth, I was pushing the taboo button in the eyes of my audience. But when I built my case, the magic happened. People either agreed with me, or disagreed with me. People started buzzing, and my site scored 150 comments, 5,000 pageviews, 343 Tweets, 68 Facebook Shares, and scores of new links. Key takeaway: If you’re going to push a button, really push that thing down. Smash it if you have to. If you want links and social media love, write something people talk about. Hit one of those buttons of buzz, and watch the magic happen. Have you written any articles that hit any of these buttons? Talk about it in the comments.